On Sunday evening, November 13, I went to my nearest Harkins theater to see Immortals. I had been watching the previews for this movie for months, and had it slated as one that I would definitely want to see. Also, I had an unstoppable craving for movie popcorn, and I have the Harkins loyalty t-shirt that gets me a free medium popcorn every time I go to the theater, not to mention the cup that gets me $1 softdrinks. I figure that what I overpay on the movie ticket, and $9 admission is definitely getting too damn high, I make up for on cheap movie refreshments inside. I could tell from the previews that Immortals would be about Gods and Men in some kind of fantastic combat, but the why of such a struggle, since there is nothing like that in real Greek mythology, is not clear. That’s a good preview–makes me curious while still pandering to my favorite fantasy elements–pretechnological violence, magic, and heroism. Immortals is a 2011 3D fantasy adventure film directed by Tarsem Singh and starring Henry Cavill, Freida Pinto, and Mickey Rourke. The film also stars Luke Evans, Kellan Lutz, Joseph Morgan, Stephen Dorff, Alan Van Sprang, Isabel Lucas, and John Hurt. The film was previously named Dawn of War and War of the Gods before being officially named Immortals, and is loosely based on the Greek myths of Theseus and the Minotaur and the Titanomachy. It was released in 2D and in 3-D (using the Real D 3D and Digital 3D formats) on November 11, 2011 by Universal Pictures and Relativity Media. So much for the credits. The story is confused, although if you blither long enough you get the gist of it. A crazed king named Hyperion has decided to conquer the (known) world, which at the time around 1250 B.C. consisted of the eastern Mediterranean and Egypt. To do this he wants to find a divine weapon called the Epirus Bow, a godly weapon that fires energy arrows. In his ruthless quest for the weapon he callously cuts the throat of the hero’s mother–thus gaining the eternal enmity of young Theseus, supposedly a Greek peasant with an unknown father. Also, there is a group of really nasty immortals called the Titans who are imprisoned within Mount Tartarus by the gods led by father Zeus. Should the Titans ever break free, there would be a dreadful war between Gods and Titans that might destroy all life on Earth. The Epirus Bow is the appointed instrument of Titanic liberation. Having said all that you can see where the movie has to go. Theseus and his friends–there are always friends and second banana sidekicks in these movies–fight the incredibly evil forces of King Hyperion. At one point Theseus gains the Epirus Bow. A bit later King Hyperion’s forces manage to take it away from him. There is lots of bloody combat along the way–it’s special effects blood–but it does spray in all directions–I can only imagine what that must be like in 3D. I saw it in 2D as usual. Finally Hyperion frees the Titans. Then Zeus and the Gods must intervene. More combat. The combat scenes are incredible. For a really peaceful kind of guy, I have an unholy love of combat for its own sake. As a relatively sane and intelligent guy, I know better than to get myself involved in physcial combat, though I had my fights when I was a kid, and I studied combat arts like fencing and archery in college. That’s what I like about sports–I see them as ritualized combat, not games. The swing of a bat or a hockey stick is symbolically the same as swinging a sword. That’s what I like about games–they are a form of mental combat. However, I know full well that in real physical combat such as Theseus or Conan participate in, I would be one of the dead guys in very short order, and since I enjoy life, I tend to avoid things like combat that would get me killed. If you enjoy combat, then you want to see Immortals. Forget about the incoherent plot. All you need to know is that there are bad guys and good guys, and they fight each other. When I first saw Theseus, I thought he was the reincarnation of Gordon Scott. Scott was a muscular bodybuilder and film star of the 50s and 60s, best known for playing Tarzan in several movies. Scott was smooth in a way that few other Tarzans were. Here’s a picture of Gordon Scott, followed by one of Henry Cavill. I don’t suppose the resemblance to a 20th century bodybuilder makes any difference. Immortals is an action/special effects movie, and no matter how good (or bad) the acting is in such films, nobody ever remembers it. Sometimes the film makers try to do something sneaky, like put ideas into the film as well. I suspect that happened with this one–there are certainly things one could talk about, such as Are the Gods justified in interfering in the life of mortals, or should they be strictly hands off? What about the brutality of the world? There are scenes in the movie that just make you sick if you stop and think about them at all. I haven’t read any official critics on this movie. I wonder how they feel about the hideous distortion of Greek mythology presented here. The legend of Theseus–hero of Athens, slayer of the minotaur–has been completely changed. The hero does everything a hero can be asked to do except one–he doesn’t find a way to survive the final battle against overwhelming odds. He dies, and Zeus takes him to heaven. The Gods of ancient Greece seem surprisingly mortal at the end–several of them die fighting against the Titans. This is just confused and wrong in so many ways. Somebody tell the director that Immortals don’t die. Definition of immortal–somebody who never dies. That could be literal or metaphorical, but IMMORTALS DON’T DIE! 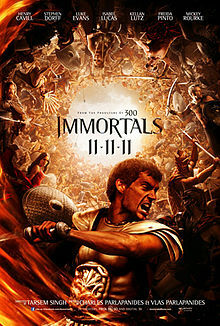 I would watch Immortals again just to revel in the action, but I’d wind up just as frustrated and revolted at the end. I wonder if Immortals would benefit from a Director’s cut edition–they have all the elements for a good movie there. Somebody just needs to go in and do something with the story to make it make sense. Maybe go back to the original legend of Theseus–something not as epic, but more satisfying. Leave the gods on Olympus, and tell the story of men. Men and monsters–that’s all you really need for a heroic fantasy movie. If you have any opinions or insights about Immortals, please put them in the comments here.